I am crazy about Heston Blumenthal, the genius behind the Michelin three-starred molecular gastronomy restaurant, The Fat Duck (see my review here), and I adore his UK TV show, Heston’s Feasts. 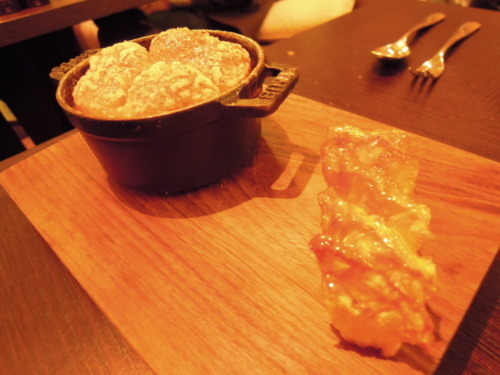 Dinner by Heston Blumenthal is Heston’s second venture which is conveniently housed on the ground floor of the Mandarin Oriental Hotel, and it is the perfect place for a meal on a day of shopping at Harrods. Dinner by Heston currently has one Michelin star, and has been named number 9 in the San Pellegrino World’s 50 Best Restaurant Awards 2012. Its menu is inspired by historic British gastronomy, and Heston Blumenthal, together with Dinner’s Executive Chef Ashley Palmer-Watts, have together devised a menu which re-invents and re-creates classic British recipes from the past centuries. Unlike The Fat Duck whose menu offers one surprise after another, the food at Dinner is more subtle and elegant, and shows off Heston’s delicate understanding of flavours. 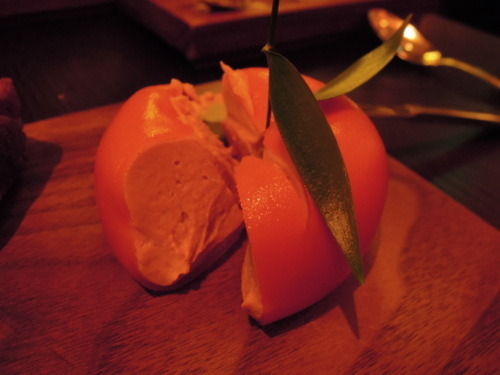 (1) Inspired by the Tudor period, the Meat Fruit (c.1500) is an absolutely unmissable dish at Dinner. 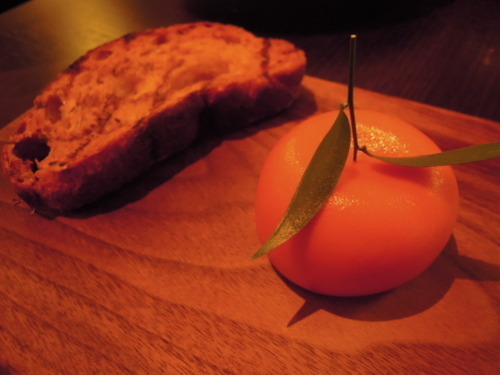 It is a ball of silky-smooth chicken liver parfait which is encased in lusciously sweet mandarin jelly, and served with perfectly grilled bread. The playful disguise of the liver parfait as a fruit has made this dish world-famous, but what impressed me the most was the kitchen’s culinary sophistication – the liver parfait’s smoothness was deliciously comforting, and formed a perfect match with the fruity and delicate mandarin jelly. 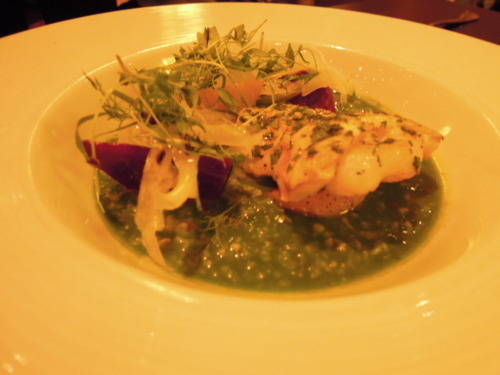 (2) The Savoury Porridge (c.1660) is an appetiser comprised of roast cod palette, smoked beetroot, garlic, parsley & fennel. 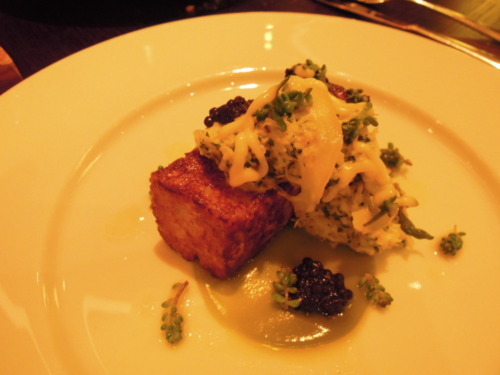 The flavours of this dish were light and refined, and the roast cod was succulent and tender. A mélange of melting textures, distinctive flavours and spot-on saucing made this a hearty and satisfying dish. (3) The Hay Smoked Mackerel (c.1730), served with lemon salad, gentleman’s relish & olive oil, was another appetiser that got us excited, despite its plain colours. The ingredients that accompanied the mackerel were gorgeously light and refreshing, and the combination of flavours was impeccable. (4) The Hereford Ribeye (c.1830), served with Mushroom ketchup & triple cooked chips, is a dish that should be ordered by any meat lover. While some may find the triple cooked chips overrated and the ribeye itself unremarkable, the mushroom ketchup, made with mushroom juice and red wine vinegar, accentuated the flavours of the whole dish. 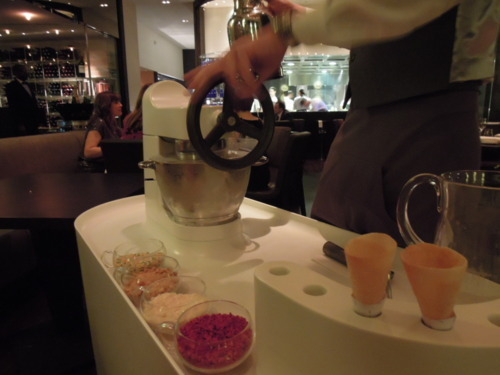 Here is a video on how Heston concocts this magnificent sauce! (5) One of the defining characteristics of Dinner is its floor-to-ceiling glass walls which enable you to look into its kitchen. The kitchen boasts a pulley system with rows of roasted pineapples, which are being lovingly prepared for the Tipsy Cake (c.1810), a.k.a the most amazing dessert in the UK! A fluffy, buttery brioche was soaked in a thick, boozy custard and served with a piece of spit-roast pineapple. The voluptuous brioche was so seemingly simple, yet extremely addictive; it was decadently syrupy and was a dessert made in heaven. 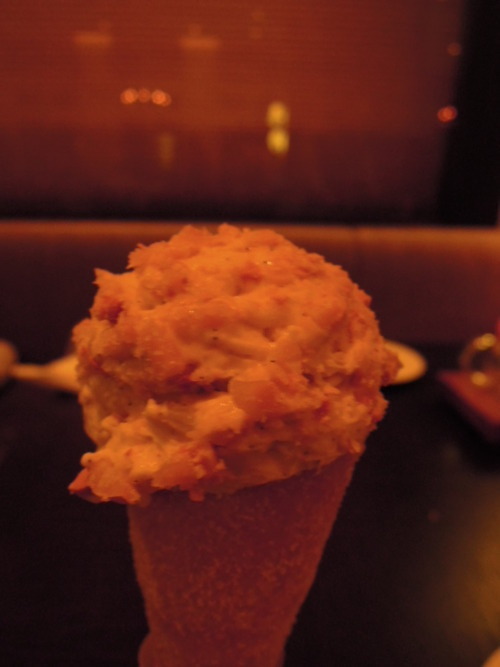 (6) R and I were not exactly craving for ice cream in winter, but when the waitress told us about the Freshly made ice-cream, we decided to give it a try. It is worth mentioning that if you order this, the whole table would have to have it, at £8 per person. 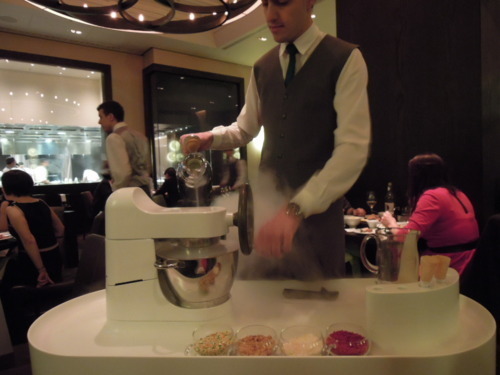 A trolley will arrive at your table, and fresh ice cream is then made before you with liquid nitrogen. We were told that the difference between this freshly made ice cream and normal ice cream is that since the ice cream is made within a short timeframe when its temperature is instantly lowered by the liquid nitrogen, this prevents the formation of icicles and will result in a super smooth texture. We liked the imaginative toppings and the delectable vanilla flavour, but the ice cream didn’t taste that much different from, say, Häagen-Dazs or Mövenpick ice cream. I would still recommend it though, just for its entertainment value if anything! Lastly, when we thought we were done with all the food and booze, we were given some chocolate praline as our post-dessert. 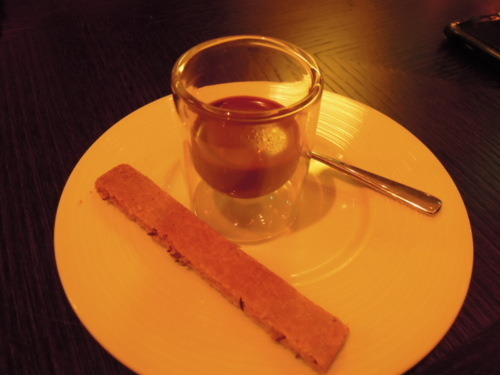 This little glass of chocolatey goodness was seductively creamy and tasty, and was the perfect end to our epic meal. Some friends who have visited The Fat Duck thought that Dinner by Heston was a disappointment, but it is important to bear in mind that the two restaurants have completely different concepts; while The Fat Duck is all about a fun, thrilling dining experience, Dinner by Heston seeks to extract the essence of century-old British recipes. I really appreciate the restaurant’s sleek and futuristic decor, as well as its creative and sophisticated approach to British cuisine – it is truly deservedly popular.